Stretching over 2,000 kilometers along the Queensland coastline from Bundaberg to beyond Cape York is the world's largest living marine formation, the Great Barrier Reef. It is an awe inspiring creation and a magnificent habitat for thousands of marine species. On the mainland, parallel to the southern end of the Great Barrier Reef is Bundaberg. Here volcanic action millions of years ago laid down an ideal bed for fringing coral reefs which can be seen on fine calm days by snorkeling only a metre or two from shore. The two "ladies of the reef? ", Lady Elliot and Lady Musgrave Islands are easily accessible from Bundaberg. Lady Musgrave is also accessible from the Town of 1770. 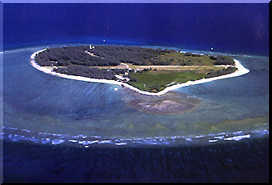 Lady Elliot is the only coral island on the reef with an airstrip, its just a 25 minute scenic flight. Fly there for a day or stay longer at the resort for a totally relaxing holiday. Accommodation ranges from beach front suites to tent cabins. Activities include reef walking, snorkeling, scuba diving, the most interesting game of golf you've ever played and a ghost walk. Lady Musgrave Island, two and a quarter hour's cruise from Port Bundaberg is unique as it is the only coral island on the Great Barrier Reef with a navigable lagoon. The day cruise allows plenty of time on the island to view the reef and marine life. For dedicated "Robinson Crusoe's" there's the option of camping on this uninhabited island. For a special experience fly out on the seaplane which departs from the Burnett River in Bundaberg and lands right on the lagoon. Cruises are also available from the Town of 1770. Both islands are true coral cays. Reef walkers will discover jewel-bright starfish, sea urchins, clams and corals exposed at high tide. In the summer months turtles come ashore to lay their eggs. Some ten weeks later, tiny turtle hatchelings make their dash for the sea. Thousands of seabirds nest in rookeries on the two islands. Many rare birds have been attracted to these havens and Lady Elliot now has its own small colony of red-tailed tropic birds. Keen whale watchers will make many sightings of pods of Humpback whales passing close by on their annual migration.